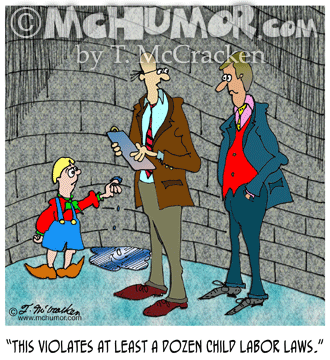 Labor Cartoon 6511: An inspector looking at the little Dutch Boy with his finger in the Dike saying, "This violates at least a dozen child labor laws." 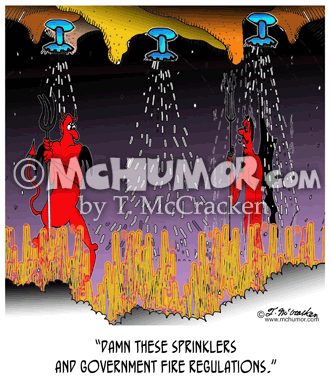 Plumbing Cartoon 4063: The Devil in Hell as sprinklers turn on dousing some fires saying, "Damn these sprinklers and government fire regulations." 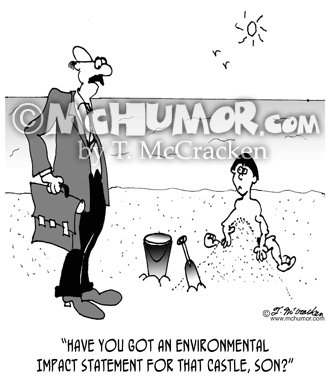 Beach Cartoon 6131: Government inspector says to kid making sand castle, "Have you got an Environmental Impact Statement for that castle, son?" 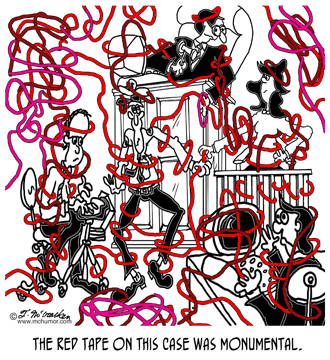 Law Cartoon 8339: Everyone in a courtroom is tangled up in red tape. 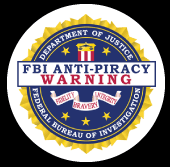 "The red tape on this case was monumental." 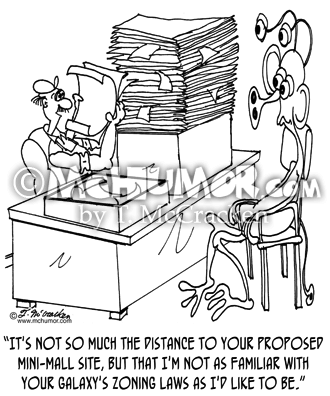 Zoning Cartoon 8000: A contractor says to a space alien client, "It's not so much the distance to your proposed mini-mall site, but that I'm not as familiar with your galaxy's zoning laws as I'd like to be." 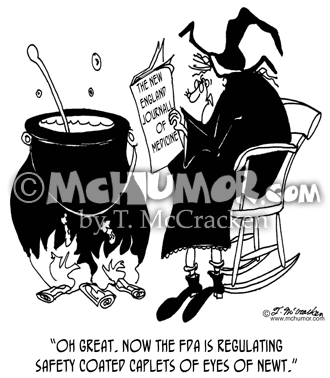 Drug Cartoon 5358: A witch reading The New England Journal of Medicine saying, "Oh great. 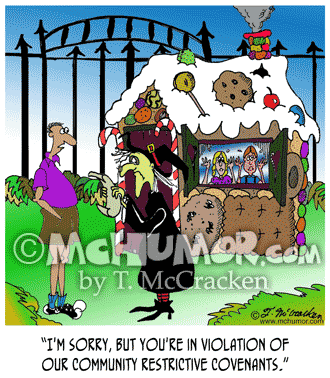 Now the FDA is regulating safety coated caplets of eyes of newt." 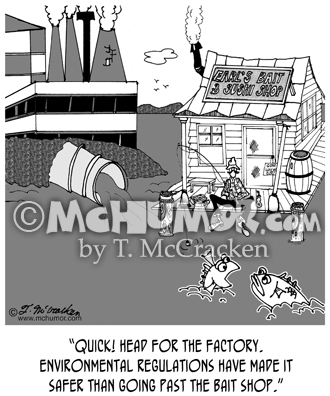 Water Cartoon 7451: A fisherman fishes on a pier in front of the "Bait and Sushi Shack." 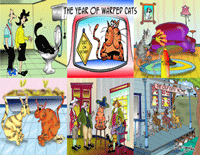 Upstream is a factory's water out flow pipe. A fish swimming by says to another, "Quick! 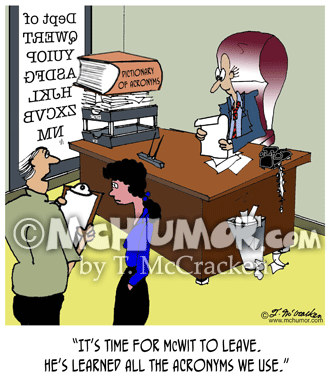 Head for the factory. 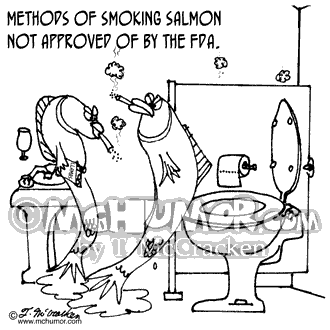 Environmental regulations have made it safer than going past the Bait Shop." 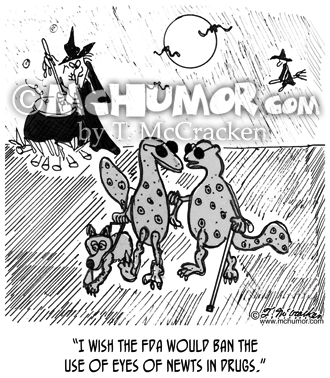 Drug Cartoon 9050: A lizard with dark glasses a white cane and a seeing eye dog says to another, "I wish the FDA would ban the use of eyes of newts in drugs."